The Criminalization series arose from an interdisciplinary investigation into criminalization, focussing on the principles that might guide decisions about what kinds of conduct should be criminalized, and the forms that criminalization should take. Developing a normative theory of criminalization, the series tackles the key questions at the heart of the issue: what principles and goals should guide legislators in deciding what to criminalize? How should criminal wrongs be classified and differentiated? How should law enforcement officials apply the law's specifications of offences? 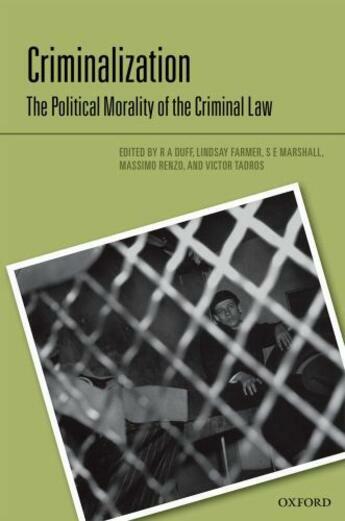 The fourth book in the series examines the political morality of the criminal law, exploring general principles and theories of criminalization. Chapters provide accounts of the criminal law in the light of ambitious theories about moral and political philosophy - republicanism and contractarianism, or reflect upon on the success of important theories of criminalization by viewing them in a novel light. Ideas that are fundamental to any complete theory of the criminal law - liberty, harm, and the effect on victims - are investigated in depth. Sociological investigation of the criminal law grounds a critical investigation into the principles of criminalization, both as a legislative matter, and with respect to criminalization practices, in contemporary and historical contexts. The volume broadens our conceptions of the theory of criminalization, and clarifies the role of the series in the development of this theory. It is essential reading for all interested in legal, political, and social theories of criminalization.